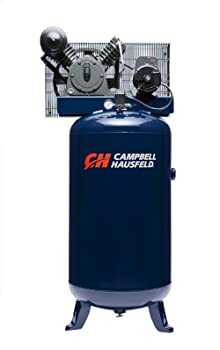 The Campbell Hausfeld HS5180 retails with a 5 HP engine, an 80-gallon tank, and a vertical design. The vertical design will come in handy as it helps you save on space in the garage. The tool also boasts great rankings on most, if not all retail sites that I perused. Its construction and design also guarantee durability. If you take care of the appliance, you can rest assured that it’ll last for years. The manufacturer’s reputation also offers the assurance of performance and reliability.